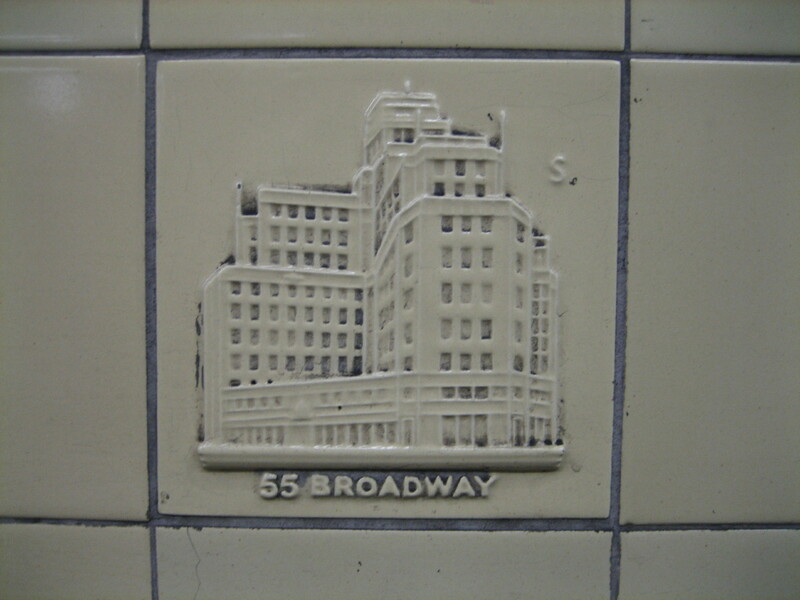 It was only a matter of time before 55 Broadway, administrative headquarters of London’s Underground since the 1930s, cleared its throat on this blog. 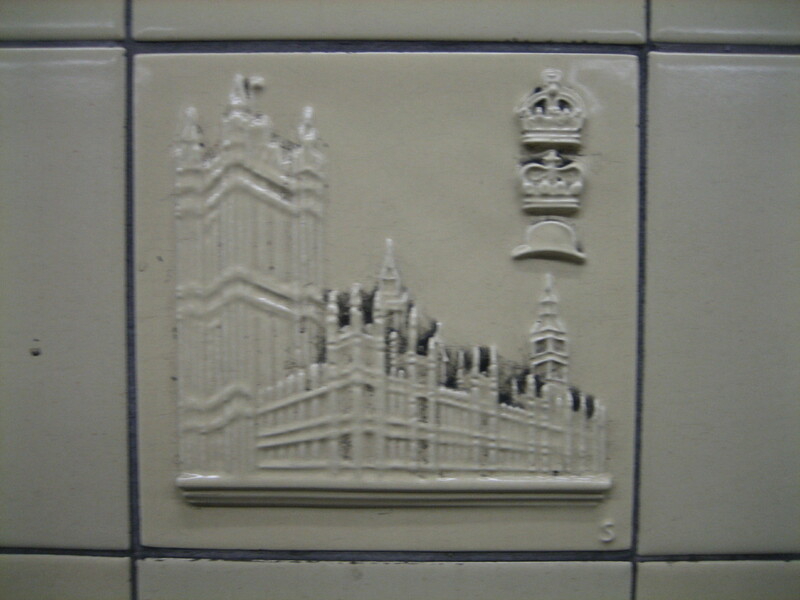 But I hadn’t expected it to do so as a wall tile on a platform at Aldgate East. And a pretty impressive one at that, nicely capturing the building’s mix of enduring majesty and shameless self-importance. OK, so that’s the Houses of Parliament, and that’s a crown, and that’s another crown, and that’s… a bowler hat? It’s a bit like the sort of half-arsed monster that frequented Peter Davison-era Doctor Who episodes, but sporting a face that looks like a character from Once Upon A Time… Man. 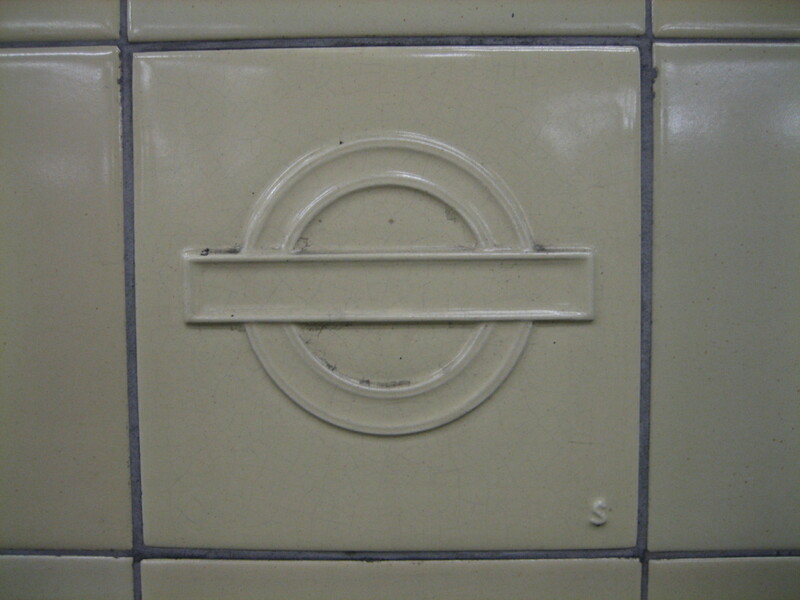 The S stands for Stabler – Harold Stabler, the designer who worked on the remodelling of Aldgate East station in the 1930s, and who helped established and popularise the influential ceramics company Poole Pottery. Stabler’s tiles are charming little bulletins of whimsy from a time when art could be both stylish and fun. They elevate a rather humdrum station into something teasingly special. They’re also the smallest things – so far – to merit an entry on this blog all to themselves. It’s actually Middlesex and not Essex, the difference being the crown – Essex is crownless versus the crowned scimitars with Middlesex. And the blades are known as seaxes, not scimitars. The Dr Who one is an interpretation of the London County Councils.arms of the time. 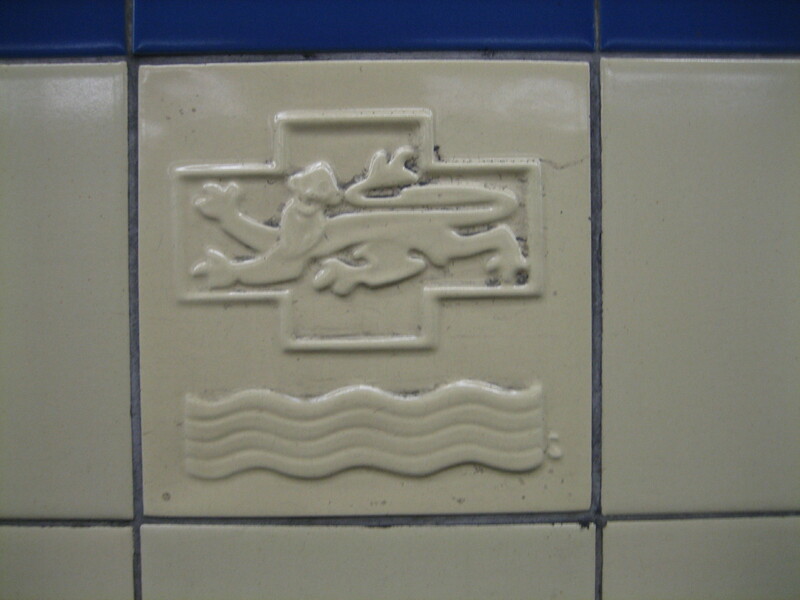 The penultimate tile has a griffin with, presumably, the Thames below. The griffin was used as a symbol by London Transport for many years, appearing on the lapels of uniforms. It was also used as a brand name for food from the LT Food Production Centre at Croydon. This not only provided food for canteens but also for staff who were unable to get to shops at convenient times. This included packets of tea and Christmas puddings.. Regarding the ones with the palace of Westminster and the mysterious two crowns and a bowler hat: I’d suggest the top one represents the Crown (as in what Her Maj wears) itself; the middle one looks like a coronet, as worn by the members of the House of Lords; and the bowler hat could well represent the House of Commons. Hence we get Queen, Lords and Commons- the hurdles that an Act of Parliament has to leap over to become law. It’s a lecture on constitutional theory in a tile! The top crown is the Imperial State Crown, used in the coat of arms at the time (it was used to crown George VI), and the middle crown is the St. Edward’s Crown, the most precious of the Crowns in the Tower of London and used today in the coat of arms. 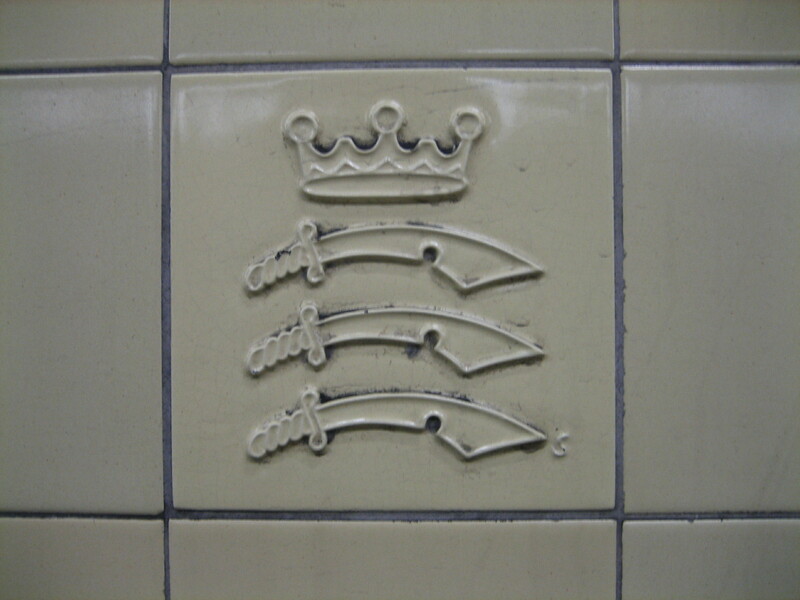 The scimitars with the crown are the arms of Middlesex- Essex is the same but without the crown. Thanks for helping clear up some of the mystery, folks. Anyone offer a corroboration for the Dr Who monster? Is it LCC or LT?! It is London County Council (NB not Greater London Council, LCC’s successor)- there are housing estates and schools all around Peckham and Camberwell with examples of the LCC’s, the GLC;s and the Corporation of London’s arms on. It’s the old London County Council coat of arms. The lion (not griffin) represents England and is shown inside the Cross of St George. The wavy lines below represent the Thames. Thanks folks. LCC it is.